Story told by Shaykh Abdul Mohsen al Ahmad. It happened in Abha (the capital of Asir, province in Saudi Arabia). 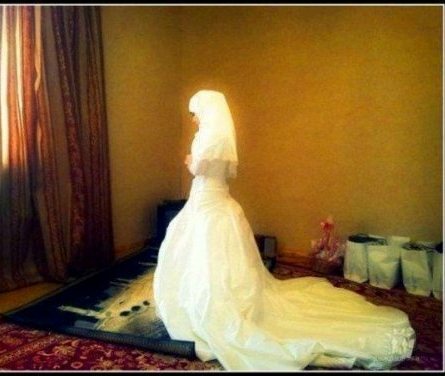 “After performing Salat Al Maghrib, she put on her make-up, wore her beautiful white dress preparing herself for her wedding party. The adhan for ‘Ishaa started and she knew that she did not have wudu. She told her mother, “Mother, I have to go to make wudu and pray ‘Ishaa”. She started to make wudu and all her make-up was washed off. Then she began to pray. At the moment she bowed down to make sujud she had no idea that it would be her last one! Yes! She died in sujud! What a great ending for a Muslimah who preferred to obey her Lord! She put Him and His obedience of the first priority. He granted her the best ending that any Muslim would have! She wanted to be closer to Him, so He took her soul in the place where a Muslim is the closest to Him! She didn’t care if she would be beautiful in the eyes of creatures but she was beautiful in the eyes of Her Creator!